Ibtihaj Muhammad, of the United States, celebrates on the podium after winning a bronze medal in a women's team sabre match at the World Fencing Championship in Catania, Italy, Saturday, Oct. 15, 2011. Olympic bronze medalist and New Jersey native Ibtihaj Muhammad claims she was recently detained by U.S. Customs, and she speculates that it had something to do with President Donald Trump's travel ban. 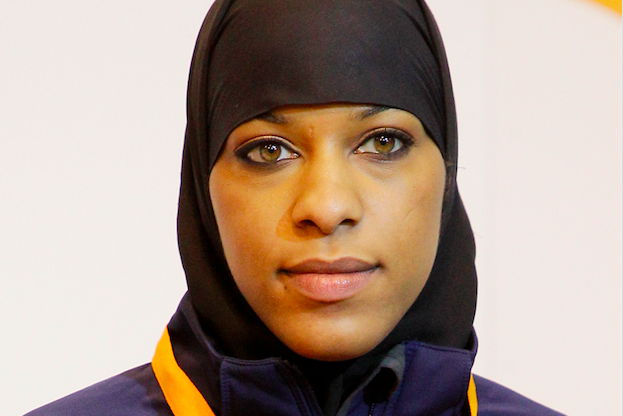 Muhammad, who is from Maplewood, Essex County, was the first female Muslim-American to win a medal for the United States during the summer games in Rio, which she did while wearing a hijab – also a first. She shared the experience in an interview with the online entertainment publication PopSugar.com. Court mulls travel ban: To compound whiplash, or calm it? According to PopSugar.com, the reporter asked, “Do you know anyone who was directly impacted by Trump's travel ban?" and Muhammad shared her account, saying that she was held for two hours and was not told why. She did not name the airport or give any other details. "I can't tell you why it happened to me, but I know that I'm Muslim. I have an Arabic name. And even though I represent Team USA and I have that Olympic hardware, it doesn't change how you look and how people perceive you." The Olympian has been vocal on social media about the president and his positions, including his travel ban, which temporarily suspended the nation's refugee program and immigration from seven mostly Muslim countries. She tweeted in opposition to the ban on Jan. 28.